My dad recently moved our more than 2 decade old company to a new premise. We celebrated its silver jubilee last year and we are really thrilled about its much bigger expansion now. To mark this celebration, our office is planning to host a “High Tea” for our loyal clients. High tea is an English meal which became popular among laborers during 1600s. Initially, it was referred to a traditional meal comprising of meat, bread, cheese, crackers, desserts like cake. But slowly its definition in non-UK countries changed to something that’s served with lighter meal like sandwiches, scones, cookies,pastries or cakes. Since S & I can’t attend this, we decided to send our wishes and love by contributing a dish for that evening. It is a tasty egg sandwich made with a creamy mixture of dijon mustard and mayonnaise. The soft moist bread and the chunks of boiled eggs leaves a simple taste on every bite. The mild flavor of the chives and pepper corns blends beautifully with the creamy mixture. It rained a bit today and this sandwich is a perfect one for this weather. Hot tea and few slices of this bread is a true delight for anyone. I added Aloo bhujjia along with the spread for a crunchy twist and I enjoyed them with a cup of hot Indian chai. When Meeta of Whats for lunch honey? 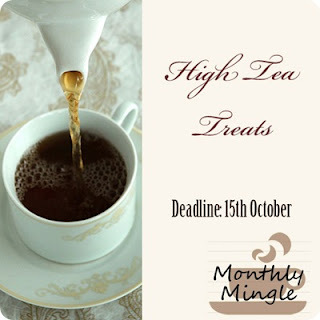 and Aparna of My diverse kitchen announced the theme as High Tea Treats , I am convinced that this post is a perfect entry for their event. Mix the eggs, chives, mayonnaise, dijon mustard, ketchup, salt and pepper. Make sure all the ingredients are at room temperature. Slice the bread in the centre so that they form two small rectangles. This makes it easier to eat. Spread the above mixture over the bread and serve. Thanks Sushma for the lovely award. I am really honored by it. Your favorite food: Satay, Amma’s rasam & sambhar, L aunty’s prawn & chicken masala! Last time you cried: Ah!I again few minutes back. I laughed so much that tears rolled down my cheek. You have a lovely space too… I will love to follow your blog from now on!!! That would be a delicious sandwich with tea! A lot of those restaurants are my favourites too..
Congrats and enjoyed ur meme..Look yummy perfect for tea time..Nice click. Wow.. superb sandwish with tea vijitha.. Loved your clicks too! Thank you so much for the award and meme. I have recently accepted the same award and posted the meme on my blog. Your sandwiches look delicious and perfect for a high tea party. Nice yummy n creamy sandwich. mmmm…yummmm! eggs and dijon mustard go so well together! The sandwitch looks superb and yes with the tea it will be marvellous. I used to have bread and eggs in the morning breakfast but after my doctor advised me to avoid eggs I am on no use policy. Thanks for the awards. I really appreciate your consideration. I want that sandwich now, yumm! just drooling rite now here..
Thats a awesome creamy sandwich with eggs! Nothing like a grand "High Tea"
There is something special about all the treats served at a High Tea. I usually would like a full sandwich of most and your Egg Spread with a twist ~ using a bit of ketchup ~ is brilliant! Nice choice for the high tea party…these are cute. Wow that looks great and yummy, perfect for the event. These sandwiches are indeed perfect. Thanks for joining us for High Tea. Happy diwali to you and your family dear Vijitha, may this diwali light up your life with prosperity and lots of happiness!!! Thanks Vijitha for the award. Wishing you all a very happy Diwali.